How could a day full of fun things like yoga and thinking about cupcakes have ended in breakdowns for both me and my student? I recently had the opportunity to work with a seven-year-old on the autism spectrum who absolutely adores math. He was way ahead of his grade level and he didn’t need any math help – his parents just wanted him to have fun and be challenged. So I carefully prepared a lesson plan built around the problem, if you have five kids at a party and 12 cupcakes, how many cupcakes does each kid get? I was hoping it would be a fun, “real-life,” social application of what he was learning. But the “cupcake challenge” precipitated a breakdown. This kid, who would literally jump up and down with delight when we worked on factor trees, who loved identifying prime numbers and listing equivalent fractions, dug in his heels and balked. I tried to walk him through the steps of the problem. I tried to break down the steps of the problem. I tried to show him how he knew how to do it. But he insisted over and over that he did NOT want to do the cupcake challenge and that he did NOT know what to do. It was the worst tutoring session I’ve ever had. Nothing like this had ever happened to me before in a math tutoring session, and I felt like a complete failure as a teacher. Before I had time to figure out where I’d gone so horribly wrong, I had to bike to my yoga studio for five hours of yoga teacher training. Everything was going just fine until my yoga teacher asked me to do a practice teaching assignment on another student. I wasn’t prepared, and I felt totally uncomfortable. I had spaced out and hadn’t really heard what the assignment was, so I didn’t know what I was doing. When my teacher observed me fumbling through the assignment and asked, “what about the original assignment?”, I felt totally humiliated. As soon as I finished the exercise, I started weeping quietly and cried through most of the rest of the teacher training. At first, these two events just seemed to make an extroardinarily bad day. Why had my student gotten so upset? Why had I gotten so upset? What happened? After turning this over in my head for a while, I realized that, not only had I unintentionally caused my student to have a breakdown and had my own breakdown as a student in a single day, but that our breakdowns had been for the same reason. My precocious seven-year-old student easily picked up equivalent fractions, prime numbers, and other topics so far above his grade level that I thought he’d take the cupcake problem in stride. Only after the disastrous tutoring session did I realize that we’d rarely done word problems, he’d never learned to do division with a remainder, and we’d never talked about fractional remainders before. And I had asked him to do all of these new things all at the same time. I hadn’t prepared him for the challenge by teaching him each of the skills separately. I hadn’t “scaffolded” the problem. My yoga teacher later explained to me that everyone else in the yoga teacher training had spent several hours doing practice teaching the previous weekend (which I’d missed because I needed to meet with my tutoring students). So for all of the other students, the practice teaching assignment was just a small baby step forward. For me, having missed those hours of practice, it was a huge leap, just like the cupcake challenge had been a huge leap for my math student. All of this boils down to a giant lesson about the value of breaking things down into small bits on purpose so we’re learning one thing at a time, in order, instead of breaking down not-on-purpose when faced with a task that’s too big of a leap. This way, we can cover the same amount of terrain, but with confident small steps instead of big, scary, breakdown-inducing leaps. 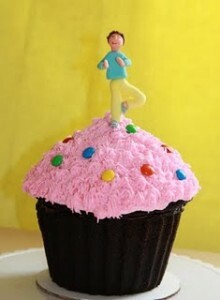 Photo credit: this fun yoga cupcake is from The Flavor Lab.